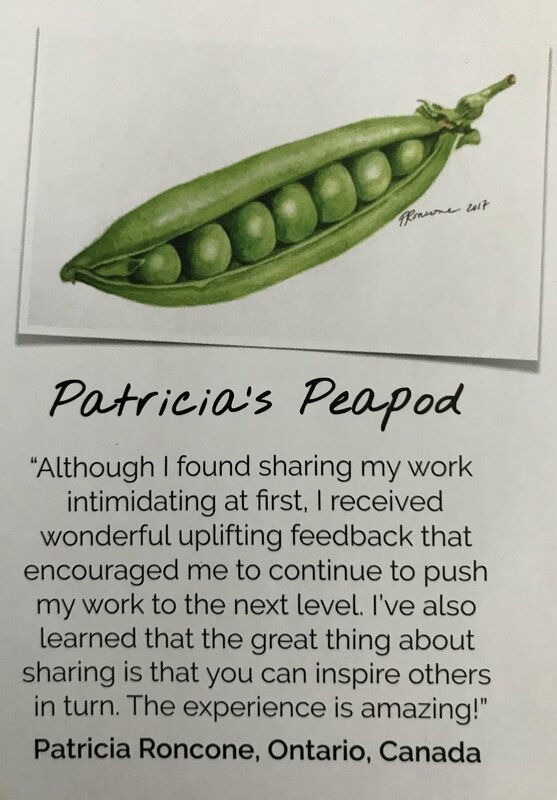 I'm very proud to announce that my pea pod watercolour study was accepted into Anna Mason's brand new watercolour book entitled, "Anna Mason's Watercolour World". It has finally arrived and I can not be any happier! The pea pod was completed using video tutorials available in Anna's online school. She had requested that students from the school submit their work and provide a brief quote explaining their experience about sharing our work with one another and how this communication was helpful in assisting our artistic practice. Well, I was one of six artists selected. I am so very happy to be part of this book. It is a wonderful resource to have and I highly recommend it to all who want to get back into watercolours or who would like to hone existing techniques or just learn something new. Before stumbling upon Anna's online school while surfing the internet, I hadn't touched watercolours in a few years. Her step by step instruction was a great way to get back into the medium and she also introduced new techniques that I added to my existing repertoire. A great big thank you to Anna for inspiring me, and many others, to pick up our brushes and give watercolours a go.